Maybe you have some slippery front steps and Grandma's on her way over, or your '78 Camaro just can't make it up the driveway—and you happen to be clean out of magnesium chloride. You need something that melts ice and, more importantly, something that you have on hand. Will kitty litter do the trick? What about salt, baking soda or rubbing alcohol? We tried several household items in our test, conducted on a nippy day on my Lakewood, CO driveway, with the temperature ranging from 19 to 25 degrees F.
Disclaimer: These solutions were tested only for effectiveness at melting ice. Some may be harmful to plants, animals, paving surfaces, cream-colored carpets and other things you might care dearly about. Others may be unacceptable to your HOA. The idea here was to find out what works in a pinch. If you need to deice on a regular basis, I recommend that you find a good, environmentally friendly ice melt product, or forget the melting altogether and just use a bit of sand for traction—and take your shoes off before going in the house. Salt is a no-brainer, I know. It's been used to deice roads forever, so of course it will work on your driveway. And it was the best performer in our test. However, it's helpful to know the limitations of salt for effective deicing. Salt works as an ice melt because it lowers the freezing point of water, from 32 degrees F for plain water to about -6 degrees F for salt water. But, as Anne Marie Helmenstine, Ph. D points out in her chemistry column, salt's effectiveness in the real world of deicing stops at about 15 degrees F.
Salt also needs a bit of water—in liquid form, not ice—to get things started. In very cold temperatures it can just sit on an icy surface without doing much good. Foot traffic and car tires will melt ice slightly and provide water for the salt, but barring that, you can sprinkle a little water on your surface before adding salt. In our test, we used kosher salt, which is coarse and thus provides a bit of grittiness for traction during the melting process. You may have heard that soy sauce melts ice, but it did pretty much zip in our test. Because it's a liquid with a high sodium content, it might work on thin ice in relatively warm temperatures. However, the sodium in soy sauce is about one-fifth of what it is in salt, so there's no sense in using sauce instead. The freezing point of standard 70-percent rubbing alcohol is -20 degrees F, so it works pretty well as a deicer. In fact, alcohol is used in many deicing products for car windshields. 80-proof vodka has a freezing point well below zero, so I thought I'd try it out…on the ice, of course. Did it work? Nyet. One warning about vodka: If you take the old "one for the driveway, one for me" approach, you may end up falling down even if the ice melts. You don't have to look hard to find someone touting a new use for baking soda (maybe it can even fix global warming!). So it's no surprise that the salty white powder has been tried as a deicer. But it did very little in our test. It does have about half as much sodium as salt, so it's probably better than soy sauce, provided some melting has already occurred. I heard of bleach as a deicer from several sources. I didn't like the idea of pouring straight bleach onto the driveway (I could just picture my wife wondering why there were indelible white boot prints in our brown carpet), so I diluted it with an equal amount of water. The result: not effective. Chorine bleach is also highly toxic to plants, so it's best to leave this solution in the laundry room. Works pretty well, as you might guess, given it's normal purpose. Washer fluid contains a small amount of methanol, and most solutions have a freezing point around -20 degrees F. It quickly melts ice and stays slushy for a long time. However, this is toxic stuff, and even though there must be untold quantities of it going into our storm water systems each year, it can't be a good thing to use heavily around the house. Sorry to get your hopes up, but I didn't test this. Fertilizer is purportedly a decent ice melter if it contains ammonium sulfate, potassium chloride or urea. Two drawbacks, though: 1) It's hard to find in the dead of winter, and 2) The local environmental and storm water authorities probably don't want residents tossing fertilizer over their driveways because it eventually washes right down to the gutter and into the storm water system. From there, it could go directly or indirectly to local waterways. Fertilizer contributes to water pollution during summer, but the idea is that most of the raw product is absorbed by the lawn and filtered by the soil below, so (theoretically) only the overspray ends up in the water system. Commonly believed to be a deicer, kitty litter doesn't melt ice, but it does provide traction on ice because it's gritty (just like Stimpy's favorite brand). Other things you can throw down for traction only are sand, dirt and fireplace ash. 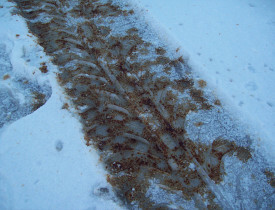 TIP: Some deicers can damage concrete, so hire a pro to seal your driveway for protection before snow season begins. Avoid applying deicers (sand is okay) to curing concrete for the first 12 months after it's installed.